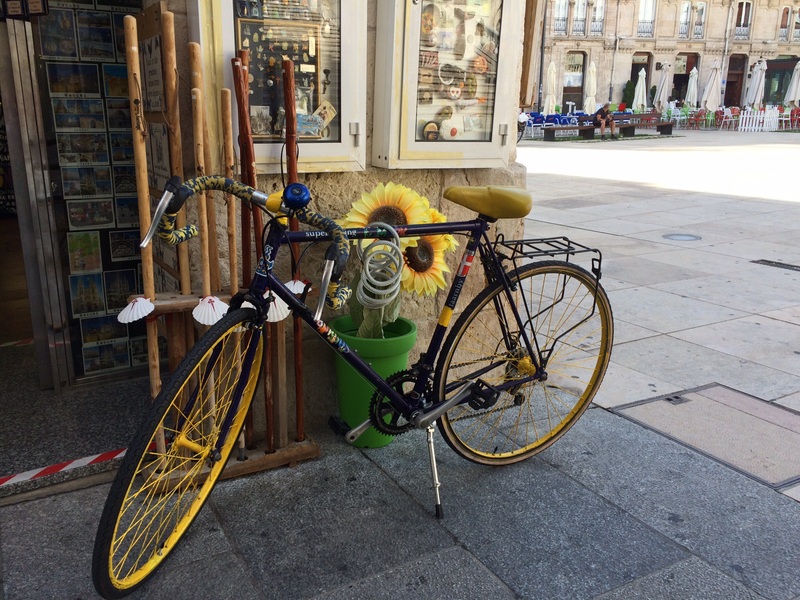 Air BNB has never failed us in our travels but you also never know what to expect in the way of “tasteful interior design.” Such was the case in Burgos when we opened the door of our apartment in the old city center. It could best be described as a nice sized flat with a very Bohemian look dripping from every corner. The walls were either painted a shade of Easter egg purple or wallpapered with newspaper articles and advertisements. Each room, from the bedroom to the bathroom, kitchen and small living room was a eyebrow-raising hodgepodge of decorating-gone-crazy. A hot-pink shower curtain with two yellow stars stapled to it and the loveseat upholstered in a fabric that looked like giant river rocks were two of the many things that stood out. But who needs elegance when you’ve got this beauty as a neighbor? 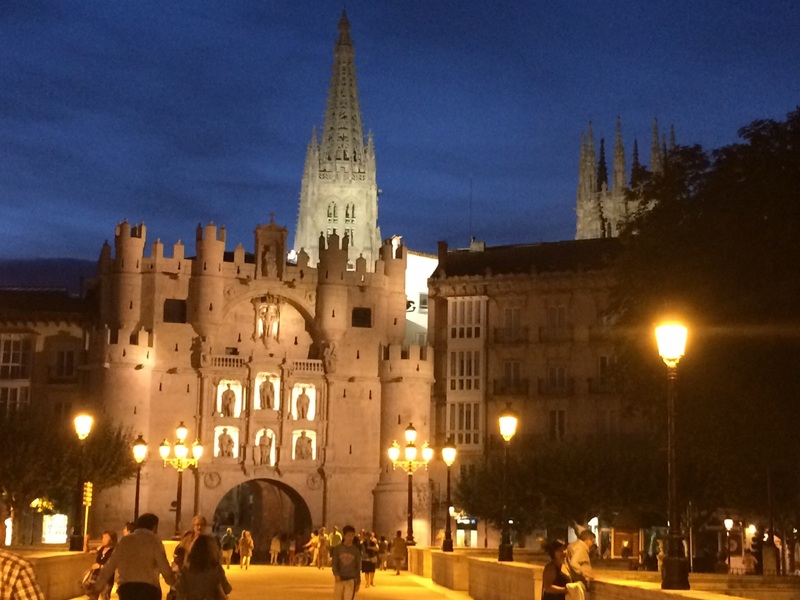 Surprising Burgos – where old meets new, there’s a vibe of urban energy even in the historic district, and the central gem of it all is the massive gleaming Gothic cathedral. 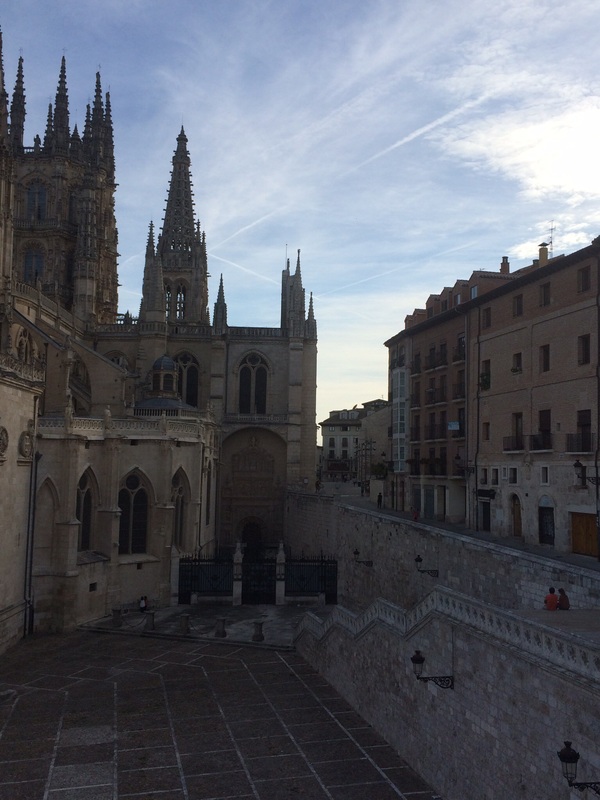 Burgos was a quick stopover for us as we exchanged train travel for a rental car to explore the Basque country just north. But we were fascinated by this vibrant city and made the most of our day and night there to find out more about what makes it pulse. 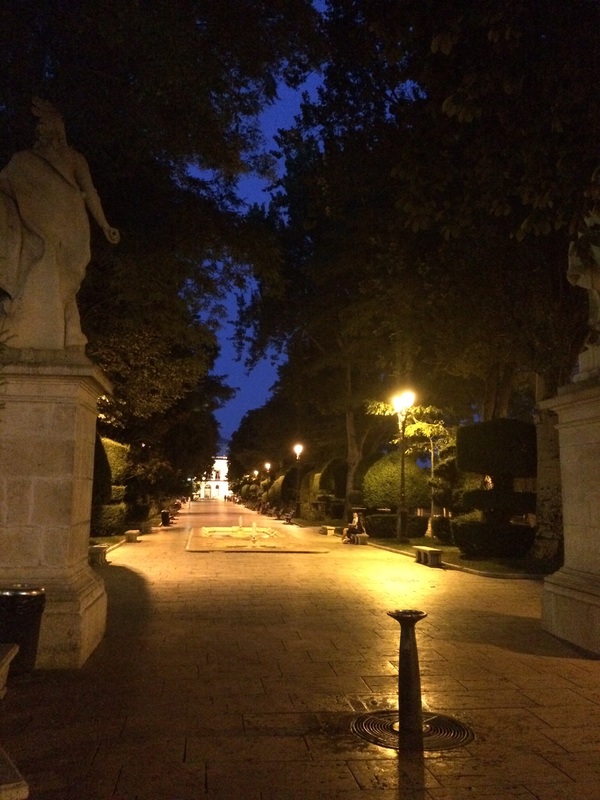 We set out just after sunset to walk around the historic city area. 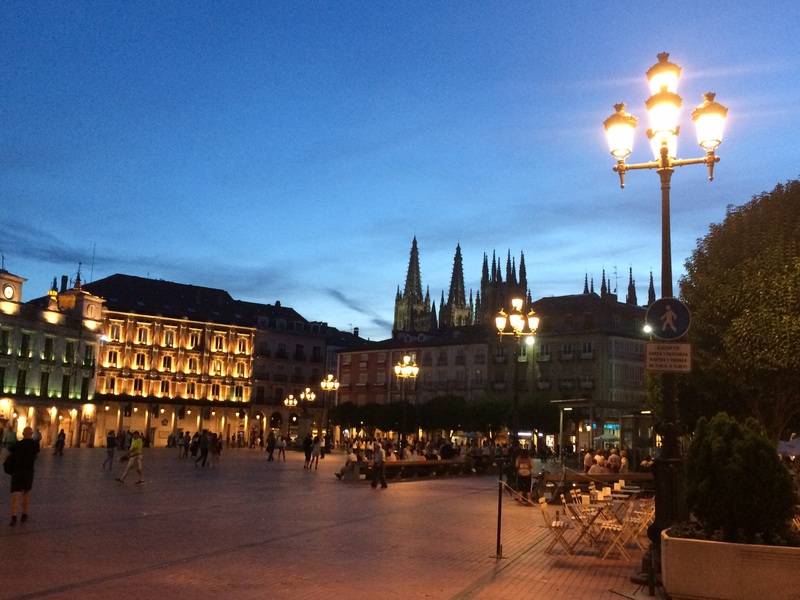 Just a short walk from the cathedral, the narrow streets open up into a giant plaza buzzing with activity- young and old and in-betweens relishing in the cooler temperatures of the evening. Walking under the city gate, we emerged at the riverside promenade – a delightful stroll under plane trees and around sidewalk cafes. About 10:00 pm we were ready for dinner and picked the place that was busting at the seams with happy locals before climbing the five flights of stairs to our purple paradise apartment to retire for the night. 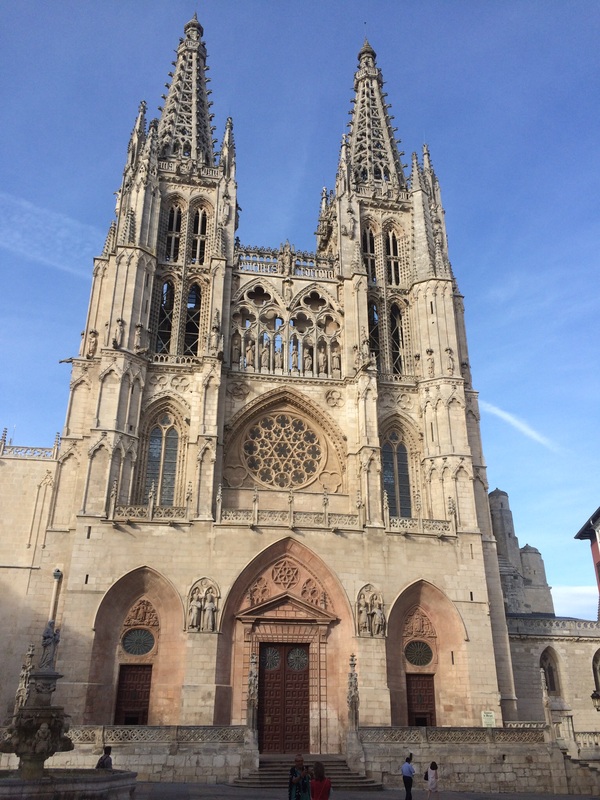 Before heading out of town, we took the morning to explore around the cathedral and bumped into some pilgrims on their way along the Camino de Santiago. You can spot them by their backpacks adorned with the symbol of the camino, the scallop shell, and their tired but happy faces as they hike (or sometimes bike) expectantly to their goal.